Curtis Jackson-Jacobs, a UCLA researcher, followed a loosely-organized gang in Tucson, Arizona, as they went looking for fights. It consisted of a couple of dozen young white men, all of them bored with middle-class life style, who went to parties hoping to find someone to fight with. They were looking for opponents who would give them some action and boost their prestige, at least in their own eyes: black guys, tough guys, Hispanic gangs, bikers, athletes. But although there were plenty of over-crowded house parties in this desert city, with plenty of loud music and drinking going on, the surprise is how difficult it was for them to find a fight. They took a belligerent attitude, bumped into people, gave people the eye, but most of the time fights didn’t happen. Fights were rare enough that when one happened, the group would spend weeks thereafter talking about it, going over the details, bragging about what they did and even about taking a beating if they lost. Why did this action-seeking group have so much trouble finding fights? Jackson-Jacobs spelled out the subtle details that had to happen if two sides were going to fight. These little details were only semi-conscious, but they boiled down to the fact that both sides had to decide that a fight was coming up, and this had to be a mutual feeling of emotion and timing. Like a demo only turning into a riot a couple of hours in, no one walks into a party and starts a fight from the very first minute. And if the minutes go by long enough, there is a feeling that this isn’t the time and place, so the action-seekers go somewhere else. The pattern holds generally across different kinds of small-scale fights: most encounters where people threaten each other with violence do not actually end in violence. Most stay at the level of angry insults — the human bark is worse than our bite. Even if it gets physical, most fights do not go beyond pushing and shoving. Videos of fights (posted from cell phones) generally show that after a few wild swings, fighters tend to spin away from each other, leaving themselves at a distance just out of reach while the fight winds down. Showing your willingness to fight is on the whole more important than what damage you do. Researchers in England, using CCTV from pubs and the streets outside, found that angry disputes were broken up, in the great majority of cases, by friends separating the fighters. A key feature that keeps quarrels from escalating is when they are balanced. Two guys quarrel with each other. They push out their chests, get their hands into fighting position. They yell insults at each other, each getting louder, trying to shout the other down. A lot here depends on what the audience will do — whether other people take sides or encourage them to fight; or do the opposite, ignoring the quarrel, which tends to take the energy out of it. Left to themselves, the belligerents usually find themselves repeating the same insults, over and over; they are both talking at the same time, which means they aren’t listening to each other, and it just becomes a contest of keeping up the noise. (How long do dogs go on barking at each other? Check it out.) After a short period of time — usually less than 60 seconds — this gets boring. They get tired of a quarrel that is going nowhere. Typically they will break it off, with a gesture of disgust, or slamming the door on the way out. Tonight is the biggest fight show of the year — a fight that has been dismissed by many knowledgeable pundits as farcical but which has nonetheless garnered more viewer interest than any boxing event in a very long time. On the face of it, this is a huge mismatch. Mr Mayweather is unquestionably the finest boxer of his generation and arguably of all time. He is both a master technician and a master tactician in the ring who has made the best boxers of his time look ordinary when matched with him. Mr McGregor is an an outstanding MMA fighter with an amazing penchant for proving doubters wrong. In truth however, this project would be the equivalent of having Mr McGregor compete in an IBJJF jiu jitsu tournament in a gi against say, Rafa Mendes — do you really think he would prevail against Mr Mendes under these conditions? My experience of watching very good MMA athletes spar against elite boxers in the gym is always the same — they are quite competitive for the first 3–4 rounds and do surprisingly well. Then around the 5th round the elite boxer begins to figure out the unorthodox or awkward movement and begins to employ ring craft tactics to tire the MMA athlete by making him work harder than he is, making him miss punches etc etc. around the 8th round a very noticeable shift occurs where the elite boxer takes over. I expect a similar pattern tonight — though probably taking less time, given the incredible skill level of Mr Mayweather. Mr McGregors only advantages are youth and size, but heavier punches are not much use if they are thrown at a target that can’t be hit, and Mr Mayweather is as always, in fine shape and has never tired in a fight. I would consider it a fine victory for Mr McGregor if he survived 12 rounds and had some competitive rounds among them. Like most people, I love to see an underdog take on impossible odds and win, so my heart is with Mr McGregor, but my mind knows this is exceedingly unlikely. In a world of uncertainty I will offer you one certainty that I truly believe — however well Mr Mcgregor does in tonight’s boxing match, I ASSURE YOU IT WILL BE MUCH BETTER THAN MR MAYWEATHER WOULD DO IN A REAL FIGHT AGAINST MR MCGREGOR. The analysis, at the University of Illinois at Urbana-Champaign, looked at 13 studies, with a combined 219 participants, conducted in the U.S., Canada, the Netherlands and Taiwan from 1996 to 2012. The majority included younger adults in their late 20s. About 60% were women. The studies examined falling techniques known as squatting, muscle relaxation, forward rotation, elbow bending with outstretched arms, stepping, and martial-arts rolling and slapping. Impact force was compared with falling while not doing the technique. All the techniques, other than slapping, reduced fall impact. But only rolling lessened the impact on the hip, by 25%. Caveat: The underlying studies were small, and only one involved older participants. Reduced strength and impaired reaction time may limit elderly people’s ability to perform fall techniques, the researchers said. You may want to learn proper judo breakfalls long before you need them. While today’s Games stress inclusivity, their ancient counterparts were rigidly exclusive. To compete in this celebration of not just Greek (and, later, Greco-Roman) identity but of proud god-fearing masculinity, you had to speak Greek, be free from the pollution of murder — and be male. Women couldn’t even be spectators. Only the priestess of Demeter could attend. The chief reason for these restrictions is that the original Games were not really about sport at all. Rather, they were one part of a major male religious festival in honor of the great god Zeus. Indeed, Olympia, site of the Games, was named for Mount Olympus, where Zeus was considered to have had his throne. I’m not sure sure that the modern games aren’t religious — depending on your definition. Apart from sacrifices and other religious rites, it included only one sporting event, a footrace of 200 yards, a distance which the Greeks called a stade (hence our “stadium”), and which took well under a minute to run. The formula caught on, not only promoting the importance of the Games still further but becoming the means whereby a triumphant runner could win everlasting fame. Like other athletes at the Games, runners competed naked. Again, the origins of this tradition were debated, but the most well-known involved Orisippus, a young man from Megara near Athens. Until 720 B.C., loincloths were de rigueur, but that year Orisippus raced so vigorously that his fell off. When he crossed the line to victory, it was seen as a sign from the gods and henceforth any kind of clothing was banned. But the athletes probably didn’t look exactly naked. By Roman times, if not before, it was common first to anoint the bodies of competitors in oil, then to sprinkle them with dust or powder. One treatise recommended the dust of terra-cotta for helping to open pores, asphalt dust for heating the chilled and yellow earth for softening the skin, commenting that: “Yellow dust also adds glisten, and is a delight to see on a body which is in good shape.” Athletes may well have looked like moving statues. It was also a time before sunscreen. 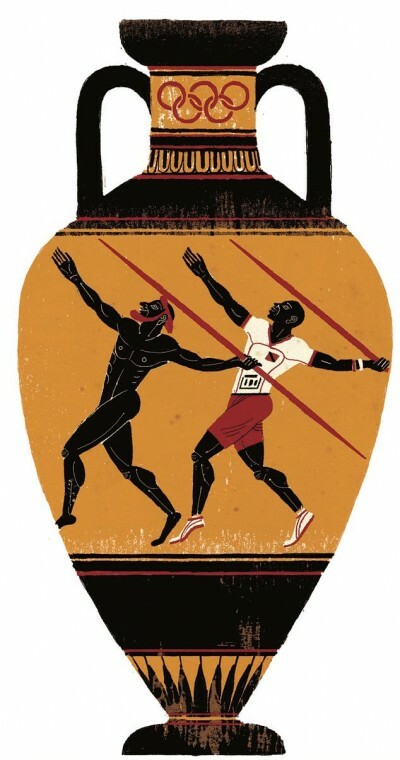 There were no team events in the ancient Olympics, by the way. When Baron de Coubertin revived — or reimagined — the Olympics in 1896, drawing on the ethos of both the ancient Games and English public schools for inspiration, he averred: “What is important in life is not to triumph, but to take part; what is essential is not to have won, but to have fought well.” This may have been a fine late-Victorian ideal, but it was far from the ancient view. At Olympia there were no prizes for coming second, and, fueled by the Homeric exhortation “always to be best,” the desire to win kudos at almost any cost motivated every competitor. For the aristocratic elite, it was in that most dangerous and exciting of all events, the chariot race, that the most kudos could be earned. Since its introduction in 680 B.C., leading Greek families from Sicily to Libya to the mainland and beyond coveted this prize above all others, because to win it was a sign of immense wealth and good judgment — and, since they hired charioteers to race for them, they ran no physical risks themselves. Now I’m wondering why there’s no gilded Trump NASCAR car. It does give some idea what a medieval tourney would’ve been like though, with armored knights fighting in a rough contact sport. Is Shooting a Martial Art? Shooting is absolutely a martial art, maybe not the way people picture martial arts nowadays, because we picture a guy in a gi doing karate, that’s the generic picture. But for me that’s not martial arts actually. For me martial art is the art of war, the individual warrior skills which it takes, and firearms are absolutely a martial art. Because it’s something that you train, something that you get good at, something you need to maintain your skill at. To me it’s another piece of the puzzle, another thing that you need to know how to do, just like tactics that go along with shooting are an important part of being a warrior, you need to know how to shoot. The training is very similar in my mind to martial arts training, in that it takes repetition, you have to know what the basics are, you have to repeat those basics, then you get more advanced. It’s about movement and getting efficient with your movement, you want to train very similar to the way you train mixed martial arts. And once you get all those mechanical skills down, then you want to train your mind around this skill, so that your mind knows how to utilize it when things are unexpected and when there’s chaos and mayhem going on. From there, Jocko tells a fun story about Nerf “lazer” tag and the importance of good tactical training. As the team got within 25 meters of the compound, a sentry at the door was alerted to their presence. The first member of the team, Petty Officer First Class Nicolas Checque, shot at the guard and ran towards the door of the compound. He fell wounded by an AK-47 round to the head as he charged into the building. Byers was the second man inside the building, sprinting in on Checque’s heels. Locked in hand-to-hand combat with the unknown man underneath him, Byers managed to subdue him with one hand and use the other to adjust the focus of his night-vision goggles. Having done so, he saw that the man was one of the captors and engaged him with his weapon. “At the same time, we’re calling out, trying to find the location of the American hostage,” Byers said. Joseph called out, alerting the SEALs to his presence, three to five feet away from where Byers had grappled with the guard. Byers immediately tackled the captive American, using his own body and body armor to shield him from the fighting. From this position, Byers noticed another man close by. The entire raid was over in a matter of minutes. Byers is the first living sailor to receive the Medal of Honor since the Vietnam War. Two other SEALs have received the medal posthumously since Sept. 11, 2001: Special Warfare Operator 2nd Class Michael Monsoor, for heroic actions in Iraq in 2006; and Lt. Michael Murphy, for valor during Operation Red Wings in Afghanistan in 2005. The sophisticated “scientific concept” with the greatest potential to enhance human understanding may be argued to come not from the halls of academe, but rather from the unlikely research environment of professional wrestling. Because professional wrestling is a simulated sport, all competitors who face each other in the ring are actually close collaborators who must form a closed system (called “a promotion”) sealed against outsiders. With external competitors generally excluded, antagonists are chosen from within the promotion and their ritualized battles are largely negotiated, choreographed, and rehearsed at a significantly decreased risk of injury or death. With outcomes predetermined under Kayfabe, betrayal in wrestling comes not from engaging in unsportsmanlike conduct, but by the surprise appearance of actual sporting behavior. Such unwelcome sportsmanship which “breaks Kayfabe” is called “shooting” to distinguish it from the expected scripted deception called “working”. Were Kayfabe to become part of our toolkit for the twenty-first century, we would undoubtedly have an easier time understanding a world in which investigative journalism seems to have vanished and bitter corporate rivals cooperate on everything from joint ventures to lobbying efforts. Perhaps confusing battles between “freshwater” Chicago macro economists and Ivy league “Saltwater” theorists could be best understood as happening within a single “orthodox promotion” given that both groups suffered no injury from failing (equally) to predict the recent financial crisis. The decades old battle in theoretical physics over bragging rights between the “string” and “loop” camps would seem to be an even more significant example within the hard sciences of a collaborative intra-promotion rivalry given the apparent failure of both groups to produce a quantum theory of gravity. Occasional but Extreme Peril for the participants. General Monotony for both audience and participants.